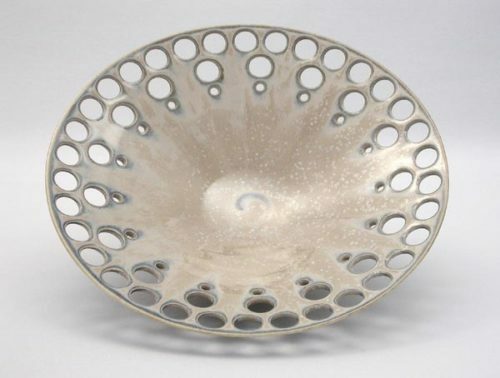 I have been using Thomas Stuart Potters Wheels every since I started Red Star Studios in 1998. We bought 16 wheels and half of them ended up being Thomas Stuarts. I immediately fell in love with the design. I love the large aluminum built in splash pan. It gives me something very stable to lean my body into. As I am throwing I kind of of wrap my legs around the wheel and lean into it from one side or the other and it allows my legs to act like a rudder as I am throwing. It kind of increases my stability and gives me a little extra strength while I am working. At first I was a little concerned about the large splash pan from the sake of cleaning it out but it is actually very easy access because the wheel head just lifts off. A couple years ago Thomas Stuart wheels was purchased by Skutt and I am happy to report that the quality is every bit as good as it ever was and really the only thing that I see that has changed is the nameplate. They are great wheels and I cant see a need to ever look further in a wheel. They give me everything I need in a potters wheel. 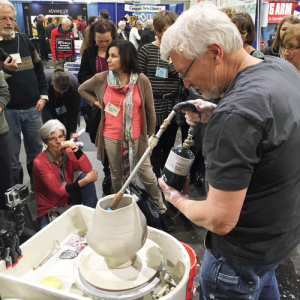 One of the latest innovations in Skutt Potter’s Wheels is the SSX Controller. It has made what was already a great Potters wheel into something even better because it’s now smoother at low speeds and its even quieter in operation. I really value sensitive adjustment when I am just starting the wheel from a stop and the SSX controller really excels at that. To hear more from Steven about Skutt wheels watch his video interview. I like using the Thomas Stuart Wheel (now Skutt Wheel) because of the power it has. Particularly when you are centering you need to work with the speed of the wheel. If the wheel starts to slow down when you put pressure on it then that’s no good. You are then using a lot of your own strength instead of the strength of the wheel. I have been working with the Thomas Stuart for quite a number of years and the thing that I probably like most is the size of the splash pan. Because of the size, you can be trimming an awful lot of work and not have any problems whatsoever to store all of the trimmings…To hear more from Judi about Skutt wheels watch her video interview. You have to watch the video to truely understand Scott’s passion for these wheels. Jon Schmidt is a Potter from Waconia Minnesota who started a YouTube channel less than year ago and is approaching 1,000,000 views with over 22,000 subscribers. His videos are funny, informative and strangely addictive. Jon recently acquired a Skutt Revolution Wheel. Check out this video of him trying it out for the first time as he throws for guests to view in one of his 3 coffee shops. Just wanted to say that I purchased the Professional with SSX drive upgrade from West Michigan Ceramic Supply in Hamilton, Mich. I took delivery Tuesday night, threw a bowl as a test drive, and absolutely fell in love!! It’s whisper quiet, which surprised me; powerful and gorgeous.